MADRID, Spain (CNN) -- Protests are expected to continue in Brussels on Friday after tens of thousands marched on the streets of Spain's capital Thursday to demand better protection for workers hit hard by the economic crisis. 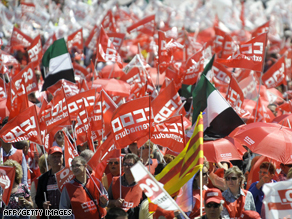 Thousands take part in the Madrid demonstration, organized by the European Trade Confederation. Dressed in funeral black to mourn the estimated 4 million jobless in Spain, demonstrators had a simple message for the government: Enough corporate bailouts; it's time to focus on the workers. The Madrid demonstration, organized by the European Trade Confederation (ETUC) was the opening shot in a flurry of activity expected in the next few days. With European unemployment rates at staggering levels, protests are planned in the coming days in Berlin, Germany; Prague, Czech Republic; Luxembourg; Bucharest, Romania and Birmingham, England. In Spain, the construction industry in particular has been devastated and unemployment has soared to 17 percent, the highest in the European Union. Spain's GDP shrank 1.8 percent from the previous quarter and was down 2.9 percent in the last year, the steepest fall in decades. Labor leaders are pushing for a New Social Deal that would afford greater protection for the unemployed. More demonstrations are expected in June as the European Parliament holds elections. The parliament recognized Wednesday that the "depth of the financial crisis has been brutal." In a response to the crisis posted on its Web site, the parliament said it has been working to establish a clearer European regulatory system with more banking supervision and also trying to mitigate the effects of the recession on peoples' lives. Members of the parliament have agreed to expand funding for workers who lost jobs as a result of the financial downturn, back full rights for temporary employees and broaden opportunities for vocational training and education. CNN's Al Goodman contributed to this story.